Watch 10 minutes of procedural space blasting from Pixelnest Studio's newest title. 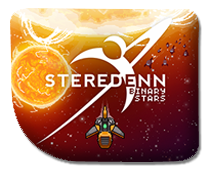 Todays Dive In is a 10 minute look at Pixelnest Studios horizontal shooter, Steredenn: Binary Stars, out now (released the 8th March) on the Nintendo Switch eShop for £11.99. Will you have the finger dexterity to navigate your ship though the hundreds of bullets flying around the screen at once?